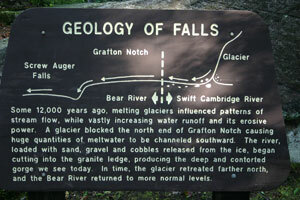 This is a great waterfall right next to Highway 26 in Grafton Notch State Park. The main plunge (pun intended) is impressive but there are other facets to Screw Auger that combine to make it my favorite waterfall in the great state of Maine. One of these facets is a natural arch just to the right (or left depending on your view) of the plunge. Very cool. It might also be called a hole. However in the state of Utah it would qualify as an arch and I'm using their loose definition. Another neat feature of the waterfall is the overall layout, for lack of a better word. When one first reaches the river it is wide, flowing over about an eight foot fall. It then narrows, turns sharply right, and drops over the main plunge and subsequent narrow gorge. This is a neat place. 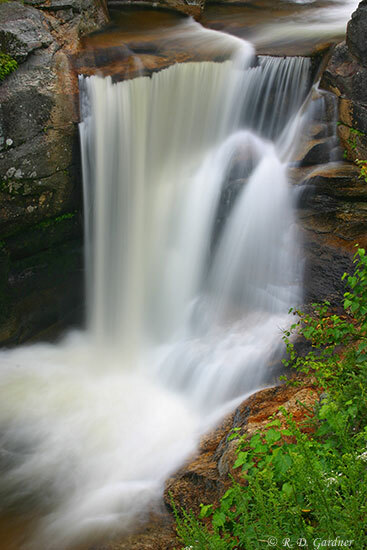 Screw Auger Falls is located directly on Highway 26. The parking area is well marked, as can be seen in the picture to the right. This picture was taken looking southeast. First of all, don't try to photograph Screw Auger Falls in the late afternoon. My first visit was late afternoon and lighting conditions were atrocious. I took a bunch of pictures anyway hoping for the best. It was a waste of time. I came back the next morning around 6:30 and conditions were perfect. You might make do in the late afternoon with heavy overcast conditions, but you will still have some issues. This is an awesome waterfall for slow shutter speeds and this naturally requires a good tripod. I did try some faster shutter speeds but didn't like the look. I would also recommend the use of a polarizer to help slow the shutter speed while at the same time cutting down on reflections. You will need to correct the color cast of the polarizer either with a warming filter or with post processing with a program like Photoshop. NOTE: I was fortunate in that the entire area was soaked with rain the day before my arrival. I don't think the flow of the Bear River as seen in my pictures is typical of early August. 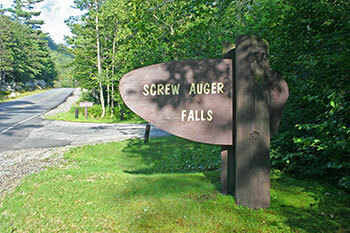 In fact other online pictures of Screw Auger Falls have a much lower volume and aren't as photogenic IMHO. There are many choices of composition, fewer on where to shoot your shots. Some of my pictures were taken with my tripod right against the fence or even straddling the fence. The best photos were taken over the fence on a rock outcropping downstream of the main plunge. I don't recommend going out there. As a matter of fact let me say - Don't go out there; it isn't safe. However, if you choose to ignore my advice keep in mind that the granite rocks are slippery when wet. Even my good hiking boots slid around some. Bare feet may very well be the safest bet.